Asher has been practicing for 9 months his choir songs. Today was his big performance. Uriah was so excited to clap for him and say “Go Asher!” Asher was excited all week. The day arrives. I can’t wait to see my little boy up on stage on mother’s day singing about God using his hands and having so much in store for him. Asher is the farthest thing from shy. But today he was. He wouldn’t stay on the stage without Austin or I with him. He didn’t get to sing. He was sad, we all were. This is new territory. The next few hours I spent trying to figure out how to deal with a disappointed little boy who experienced failure in the face of fear. Just like Jesus does with us, I want to help him see the truth, the reality that he messed up, but also the reality that the cross is big enough for even his mistakes. “We boast in the hope of the glory of God.” Rom. 5:2 The only place for my hope is that God’s character will be revealed and seen. Marveled at even! “On the day he comes to be glorified in his holy people and to be marveled at among all those who have believed.” 2 Thes. 1:10 But that means that sometimes His character/heart might not been seen through some circumstances till then… when he comes again. I can hope in the reality that relief is coming and God’s character and purpose will be revealed… marveled in through my circumstances. The hope of glory! Obedience only comes as a result of trust. Who are you trusting to make you right before God? Are you trusting in your own effort to be good enough? Hoping that the good will outweigh the bad? Or is your hope in the fact that you (just like me) are guilty and nothing can erase that but Jesus lived the perfect life and died to make a way for your guilt to be forgiven. Are you putting your hope in the innocence of Christ on your behalf? If so. You can have hope! Hope. The hope that Christ’s purposes and character will be seen through my strong-willed boys. The hope that the frustration, discouragement and exhaustion will prove to be worth it. God’s Word. His promises that He will never break. God’s Spirit. Who reminds me what’s true. Who teaches me and instructs me. Who enables me, giving me strength and ability to do what only He is capable of doing. My strong-willed boys and for God bringing them into my life. They are a joy and being used in the hand of God to develop in me perseverance and character. And giving me a longing for God’s heart to be revealed… hope. Love this BLOG! Love One Thousand Gifts too.. what an amazing book and the truth that we need to be available to show His glory to the world. I can totally relate to your words today dear friend. Love you! I, for one, am encouraged by your son's reaction. Having seen it first hand, knowing just a few years ago it was my "strong willed son" (age 4)who fell off the bleachers backwards when the "couldn't-stand-still"s got the best of my Caleb. (oh yeah... nose bleed and all) See it wasn't asher or even uriah, but the smiles on the faces of his parents, who wanted more than anything to see him sing. Truth be told, the last thing I want for my kids is "normal" and that manifests itself differently in 3 year old boys, than just about any other creation on the earth. The trick is to know that God's gonna use it. period. And today, to see you and Austin united, encouraging to the very end, reminded me that this grind of parenthood is progressing. I was in your shoes a few years back and I am in shoes some other poor mother walked in a few years ago. You look much better in those shoes than I ever did. Thanks so much for the encouragement Amanda and Becca! Thanks for the laughs Becca. "Obedience only comes as a result of trust." Thank you for that. I think I shall cling to that today. I came through the Multitudes on Mondays--and I will be thankful all day, if only for that quote. It's one of those days when I feel like quitting - turning in my pink slip - but there's nowhere to turn it in to! :) Thanks for the encouragement to know I'm not alone with kids who don't act perfectly. I, too, am so thankful for Hope and for God's Word. There is no feeling like hopelessness and, althought I dare go there at times, I am contunually broght back to faith in God's Word. Oh my, I can so relate to this one, Laura. I've wished for a different outcome with my boys more times than I can count (and I'm not proud to admit that). And I've asked the why me? question, too. But then there is hope, and the knowledge and trust that it is all in God's hands, and he knows the plans he has for us. Sometimes I am even able to sit back and let go, release the worry and fear and relax into his love. 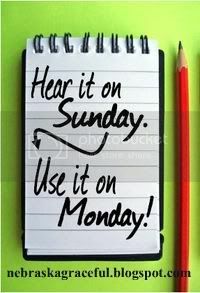 So very glad you linked up today -- and welcome to the Hear It on Sunday community! It's lovely to meet you here! I jumped over from Michelle's and I love the way you love those kids and I know that you know that you know that your kids are not the only ones who ___________. Also love that you are raising those kids to know the Hope of Christ. And might I say having a plan for sharing the gospel is a great idea!